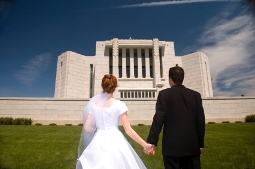 Members of The Church of Jesus Christ of Latter-day Saints believe that when sealed by the proper priesthood authority in a dedicated temple of the Lord, marriages and families can be united not only for life, but for all eternity in what is known as a Celestial marriage. To receive these blessings, couples in the Mormon Church must continue to live worthy of the covenants they have made to each other and to God. Members not married in a Mormon temple and new members who are already married can still receive all the blessings of a temple sealing. When members are found worthy, and new members have been in the Church for a year, they can go to the temple and have their marriage sealed for all eternity. The following is a list of common questions regarding LDS temple weddings. 1 Who can attend the temple ceremony? 2 What should guests wear? 3 Can the bride wear her wedding dress in the temple? 4 How long does a temple sealing take? 5 When will pictures be taken? Who can attend the temple ceremony? Members of The Church of Jesus Christ of Latter-day Saints who have current temple recommends are able to attend a sealing ceremony. Couples are asked to keep the number of people invited to a sealing relatively small with immediate family and only a few close friends. This allows the service to remain reverent and sacred. Waiting outside the temple until the bride and groom exit the temple. Many of the temples have visitors' centers that they can go to, or they can walk around the temple grounds. All temple grounds are beautifully kept and allow for peaceful contemplation. Often there is a photography session on the temple grounds after the sealing concludes. Often the family gathers for a meal afterwards in a home or restaurant. Arranging a separate "ring ceremony" at the location of the wedding reception. Rings may be exchanged in the sealing room, but exchanging rings is an adjunct, rather than an integral part of the sealing ceremony, and is done by choice. Ring ceremonies can include counsel from a Bishop and words of love and commitment from the bride and groom, so the ceremony can be very satisfying for those not attending the temple sealing. Those attending the sealing should wear clothes that would be appropriate for Church. Modest dresses or skirts and blouses for women and a suit or white shirt and nice slacks for men. Tuxedos and formal wear are not to be worn in the temple. Can the bride wear her wedding dress in the temple? Brides can wear their wedding dress in the temple, but the dresses must have long sleeves, a high neckline, and all sheer material must be lined. Brides are also asked to wear a dress that has either no train or has a way to bustle it up. Some temples provide jackets or pin-ons that can be worn under or over the dress to make them appropriate for the ceremony. Bridal gowns must be white (not ivory, beige, or pastel), with no colored or metallic thread or colored decorative accents. The bride should always check with the temple in advance to determine whether a dress is appropriate. If the bridal gown is not appropriate for the sealing, the bride can wear an acceptable white dress and then change afterwards into her gown (in the bride's dressing room) for photographs outside on temple grounds. How long does a temple sealing take? Most do not take longer than thirty minutes. There will however be some variation depending on how many people are attending and the advice that the officiator gives. It does take time for the bride to dress for the sealing, and for going to and coming from the sealing room. Guests are asked to arrive about a half hour before the sealing. They wait in a waiting room inside the temple, and then they are guided to the sealing room before the bride and groom enter. Because of the sacredness of the temple, photography is not allowed inside. Most couples opt to have a photography session either before or after the ceremony. This is usually done on the beautifully landscaped temple grounds.